SKU: JFX007. Category: Biome Series by John Fox. 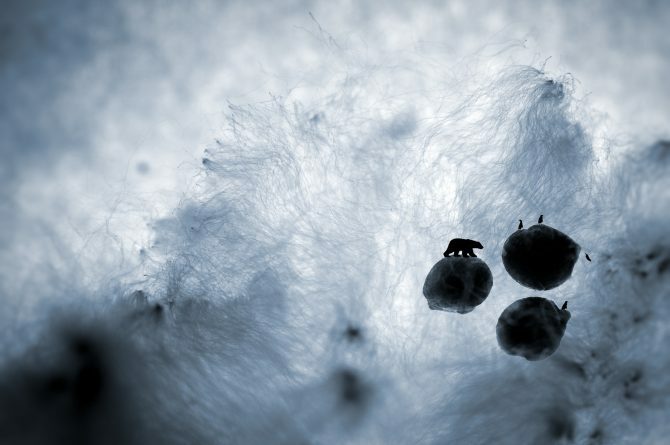 While planning possible images for this collection, snow and ice represented by the fluff found in seed pods was one of my earliest follow up concepts. This took much longer and was much harder to source than I had guessed. After months of searching I found a pod from a Kapok tree in a parking lot. The fluff was very hard to manage and position for my shot so I decided to wet it in order to make it more manageable. This did not help as it became surprisingly more awkward to work with. I have since discovered Kapok fibres have been used in the making of life jackets due to their water repelling properties. You live and learn. Gary Larson, creator of The Far Side, had a cartoon with a polar bear and a penguin talking. When the cartoon ran, complaint letters poured in that polar bears and penguins are not found in the same polar region. He was surprised so many people minded the geographical inaccuracy and not the fact that they could talk. My image is representative of the regions with snow and ice and I therefore wanted both species present. It is more about what people expect to find in such places as opposed to a scientific documentation.